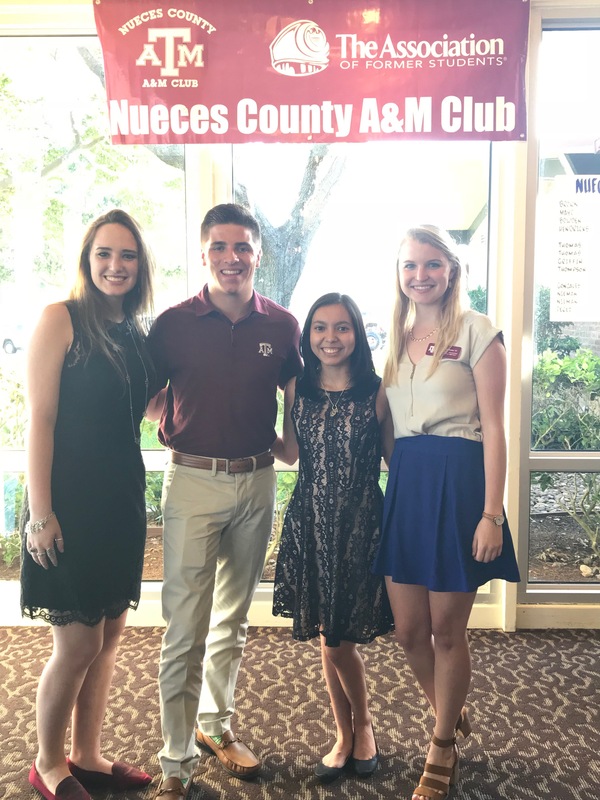 “I am writing to thank you again for the Nueces County A&M Club scholarship. I am a freshman business honors/finance major, and I plan on pursuing a career in investment banking. I am loving my first semester at A&M, and I have joined two organizations: a Freshman Leadership Organization (FLO) called FORME (Freshman Organizing and Running Mixed Events) and Business Student Council (BSC). Once again, thank you so much for your club’s generosity in gifting me the scholarship! Jimi Savage graduated from Banquete High School in 2018 and has been awarded a 4-year scholarship for $1,000 a year. Jimi graduated as the Valedictorian of her class and consistently made the honor roll throughout her high school career. Throughout Jimi’s time in school, she’s been heavily involved in student life and extra-curricular activities, including Banquete FFA, Bluntzer 4-H, Nueces County 4-H Ambassadors, Nueces County Travelin’ 4-H’ers, Banquete Speech and Debate, National Honor Society, and the UIL Academic Team. She has also served as a leader at the school, serving on the Student Council, and captain of the Varsity cheer team her senior year. Jimi also spent many hours volunteering with multiple groups. Some that were close to her included a school-wide toy drive, “Can You Spare a Square?” toilet paper drive, assisting with the Nueces County Junior Livestock Show, and many others. On top of her extra-curricular activities, she completed multiple dual credit and AP courses. At Texas A&M, Jimi is planning to major in Biological and Agricultural Engineering through the Dwight Look College of Engineering. This field interests her because of her family’s background in agriculture, and her time in organizations including FFA and 4-H. After she earns her degree, she hopes to pursue a career with the USDA. Jimi can’t wait to get involved on campus, possibly in Student Government, and attend all sorts of events. Tyler was born in Houston, Texas, but was raised in Corpus Christi, TX since the age of three. He graduated number four in his class of 487 students from WB Ray High School. Throughout his time in high school, he was heavily involved in many extracurriculars such as National Hispanic Institute, Triumph Over Kid Cancer (TOKC), Spanish Honor Society, National Honor Society, Founder and President of the Texan Anglers Fishing Club, the Young Investors Club, and supporting all of his school’s sports teams. He also served as a leader in the community hosting two kid fish events for youth in the Coastal Bend, serving as captain of the high school golf team for two years, and logging over 400 hours of community service. While he spent a bulk of his time in academics, his true passion lies in the outdoors. He spends the majority of his free time hunting or fishing. He also thoroughly enjoys golfing and has played since he was six years old. In the summer of 2018, he worked as a deckhand on an offshore boat stationed out of Port Aransas, Texas. In college, he will double major in finance and business honors with a minor in Spanish in pursuit of becoming an investment banker. This field interests him because he enjoys meeting new people, travelling, and problem solving. In College Station, he looks forward to being involved on campus, participating in organizations like Aggie Anglers and watching the Aggies as they take on opponents at Kyle Field. Katerina Garcia graduated from Tuloso Midway High School and has been awarded a 4-year scholarship for $1,000 a year. Katerina graduated third in her class and made honor roll throughout her high school career. Katerina has been heavily involved in student life and community organizations, including marching band, National Honor Society, Yearbook and Business Professionals of America. She’s also been involved in her community by volunteering through Girl Scouts and her church. At Texas A&M, Katerina is planning to major in Aerospace Engineering. She wants to go into this field because she aspires to push our boundaries in space exploration. Katerina can’t wait to become apart of the Aggie family and take part in all of the traditions.